I heard an unsettling alarm as the screen in front of me flashed red. The instructions caught me off-guard. I was getting scolded for looking at my instructor. And it was the car scolding me! I was midway through a private tour of Visteon’s booth during last week’s Consumer Electronics Show (CES), and enjoying every minute. Frankly, I’m amazed at the new auto technology we’ll be seeing in the next generation of new cars manufactured. Visteon is just one of the many technology companies revolutionizing the way cars will be driven over the next few years. The company’s “booth” was actually a giant tent set up outside the Las Vegas Convention Center, chalk full of examples of dashboard displays, sensors, high-powered computers, and car simulators. Not just anyone could get into the booth. Personal tours were given out “by appointment only” a sign stated out front. But the Visteon team was kind enough to make an exception for me, and one of the company’s executives personally walked me through the exhibits. I literally could have spent an entire day in that tent learning about the possibilities for new car technologies in the very near future. 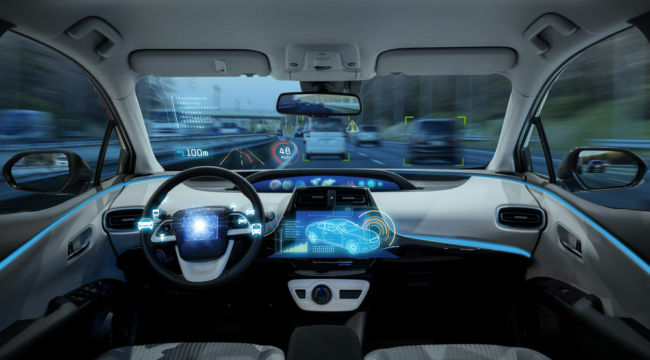 There were autonomous systems that would take full control of a car, warning drivers when their attention was needed, and allowing them to focus on other things until that point. I even saw a 3D display that projected a warning that seemed to jump off the dashboard. No glasses needed! All of these are systems and luxuries that are being integrated into the new cars manufactured right now. We really are at an exciting point in history where things that used to seem like science fiction are actually being built and sold. If you were following me on Twitter, you probably saw the pictures I took of some of the dashboard displays the company is working on. For income investors, these new advances are poised to drive some big profits and generous cash payments. For years we’ve seen technology companies like Apple drive new sales by offering incremental improvements to their existing products. Think about all the people who bought the iPhone 5, 6, 7, 10, XR, etc. These incremental advances are a great way to generate extra revenue from buyers who want to have the newest technology. In the auto market, we’re about to see the same type of technology push new car sales. That’s because over the next few years, car companies aren’t just going to be tweaking the front grill, adding a bit of torque to the engine, or expanding the size of a moon roof. Customers will purchase new cars not just to get the latest trim package, but instead to get a car that performs dramatically different than any vehicle they’ve owned before. I know I’m looking forward to owning an autonomous vehicle sometime in the next few years! As a potential car buyer, this is an exciting time. But as an investor, it’s even better! Because auto manufacturers will be able to profit from these new advances, thanks to the strong demand that technology will generate. There are many reasons to like the American automakers right now. In addition to new technology coming down the plant line, we also have a robust economy with a strong job market. The expansion in employment has left more Americans with steady paychecks and money to spend on new cars. That’s helping to keep demand for cars here in the U.S. high. On top of that, the U.S. dollar has been pulling back. This may sound like a bad thing, but for companies like Ford (F) and General Motors (GM), a lower dollar makes it easier to sell their cars in international markets with stronger currencies. So in addition to strong U.S. demand, these companies will have attractive export businesses this year. And don’t forget about the dividends investors are pulling in. Thanks to the strong cash flow that these companies generate, shares of Ford are currently paying a 6.7% dividend while General Motors pays investors a 4.0% yield. Not bad for stocks that are also set to trade higher thanks to profit growth in 2019. I’ve been a fan of American auto stocks for some time now thanks to their stable businesses and lucrative dividend yields. But the Consumer Electronics Show gave me even more reason to like these investments as advances in auto technology drives even more demand for cars, trucks and SUVs over the next few years.